Dipesh Shrestha/Republica Lawmakers from various nine opposition parties including the main opposition CPN-UML stand up from their seats to protest the government’s tabling of the constitution amendment bill, in parliament on Sunday. KATHMANDU, Jan 9: Although the constitution amendment bill was tabled in Parliament amid their protests on Sunday, various nine opposition parties including the main opposition CPN-UML have vowed to thwart the amendment bill. The opposition parties have wokred out a strategy to allow deliberations on election-related bills, but to protest against the constitution amendment bill in Parliament. “We will allow Parliament to move forward with the election-related bills. But we will protest against the constitution amendment bill. We will not allow this to be endorsed by Parliament. We will stand firmly against it,” said UML Deputy Parliamentary leader Subas Chandra Nembang. 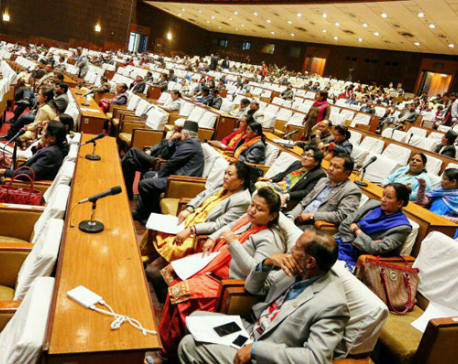 Together with the impeachment motion against Lok Man Singh Karki and the election-related bills, the government had tabled the seven-point constitution amendment bill amid strong opposition from the main and eight other opposition parties. The amendment bill, among other things, proposes to revise the boundary of Province 5 -- something the opposition parties call unconstitutional. CPN-UML Chairman CP Mainali said the amendment proposals, especially the one relating to revision of provincial boundaries, is against the spirit of the Constitution. “This constitution does not allow revision of provincial boundaries without the involvement of the provincial assembly in question. Since the ruling parties have forcibly tabled the statute amendment proposal in Parliament, we will definitely stage protests against this,” said Mainali. CPN-ML is one of the nine opposition parties that have stood against the amendment proposal. Earlier, the opposition parties had announced lifting of the House obstruction if the proposal concerning revision of the Province 5 boundary was withdrawn from the bill. They have maintained that the recent Supreme Court ruling had reinforced their stance that revision of federal boundaries without the consent of the provincial assembly is unconstitutional. Sources said that following an informal understanding with the ruling parties, the opposition chose not to obstruct the House meeting even though they knew beforehand that the government was tabling the amendment bill along with the election-related bills and the impeachment motion against the anti-graft body chief. Opposition party leaders said they are even mulling allowing discussions on all provisions except the one concerning revision of boundaries. 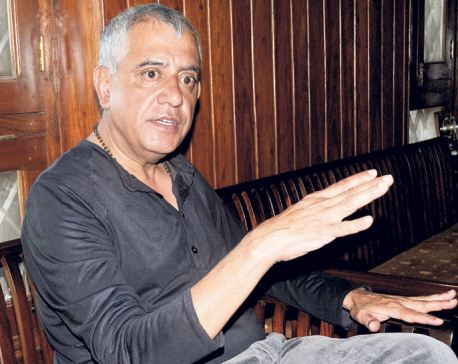 “Of course, all the provisions that are included in the constitution amendment bill are not in the interest of the nation. If the ruling parties move forward with the amendment bill inclusive of the revision of provinces, we will respond effectively,” said a party leader, asking not to be named.